Skinny cargo. Wash KHAKI. 98% cotton 2% spandex. Antique Rivet. We help the missing, the lost, and the forgotten, persons & pets in the United States. Button/Zip Closure. 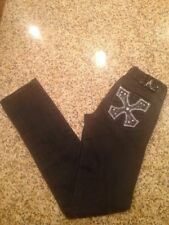 Flair leg Juniors Antique Rivet Jeans. Machine wash cold, no bleach, dry low, warm iron. Size 25, inseam 29. 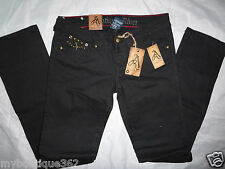 '); } --> ANTIQUE RIVET JEANS NEW WITH TAG ANTIQUE RIVET JEANS ---Spice up every look you don with these sleek and stylish Antique Rivet™ jeans. 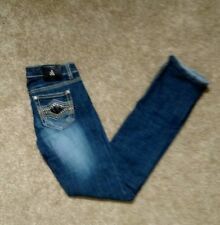 ---The Juniors jean accentuates your waist with a mid rise and slim thighs that below into slightly tapered cuffs. ---Chaucer wash is a dark indigo with sanding, heavy whiskering, long tears, and flourished Middle English verse. 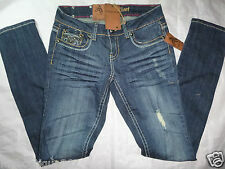 ---Decorated back and coin pockets feature patterned stitching and contrast fabrics. ---Five-pocket construction with button flaps at back pockets. ---Skinny thighs with tapered legs. ---98% cotton, 2% spandex. ---Machine wash cold, tumble dry low. ---Imported. ---Measurements: ------ Inseam: 32 inches ------ Front Rise: 7 inches ------ Waist: 25 inches Check out my [other items] (http://search.ebay.